I feel bad... I sometimes get so caught up in law school and blogging about that, I forget to blog about the process that got me here. Law school application season is upon many college seniors and I am sure you guys would like some insight! Law school applications are not a fun process... I was so tired of staring at LSAC by the time I was done. Despite this, it is a critical part of the process and you must just buckle down and get through it. I have outlined my suggestions to make law school applications easier and more effective. I was accepted into every school I applied to with scholarship including two full tuition scholarships so they should work! Before I get started on tips, make sure to register for a LSAC account (Law School Admissions Counsel) as they control everything and that is where you will make your applications. Additionally and hopefully, you have already taken the LSAT or have it scheduled for early Fall. Without a LSAC account and a LSAT score (or upcoming administration date), you cannot really start the law school application process. Law school applications generally open in early Fall. Just like with anything big, the earlier you start the better. I tried to get most of my application work done the summer before my senior year of college so I didn't have to worry about calling for references, writing my personal statement and my resume during my Fall semester. I had to take the October LSAT due to studying abroad in the May of my Junior year so I spent that summer studying for the LSAT and getting application stuff ready to go so when the applications opened in the fall, I could submit immediately without last minute stress. Your personal statement is so much more than just an explanation on why you want to be a lawyer or whatever it is you chose to write about. It is pretty much a writing sample. Use good grammar, draft it several times and get as many eyes to look over it as possible. I sent it to so many people for grammar checks, spelling checks, and overall impressions. I had my college English professor help me with it, my legal advisor, a local attorney and my best friend (another law student). The more input I could get to make it the best piece of writing I possibly could, I did. I wanted it to be without flaw and written in the most poignant way possible. I did not let anyone sway my decision on what to write about because I felt that was the most important part- it was a way for the admissions committee to get to know me and get a feel for me. Beyond that, I accepted any and all help to make it as strong as possible. There is no shame in asking for help and guidance on a piece of writing that is basically you law school interview. The application process can be pretty messy and stressful- especially if you are applying to multiple schools. I found that organization was key for keeping myself from getting stressed. I applied to 8 schools so there was a lot to keep straight. I first made a folder within my computer for law school application materials. Inside that folder was another folder for each school I was applying to. Inside each schools folder, I had a list of what was required for the application (they all vary slightly), a tailored personal statement for that school, a list of which references I would use, a breakdown of what their previous year medium LSAT and GPA and any other materials I would have to turn in or that mattered for that school. This helped me to never send the wrong personal statement to a school (for example: listing Ohio State inside the statement when I was sending actually it to Indiana University) which would have made my application less impressive. Also, it helped to keep my mind straight knowing that everything was organized and in one simple place. I also kept a running to-do list on my desk of what I needed to be doing for applications so that I never forgot to finish something and I could have the satisfaction of crossing things off and watching the list shrink. Organization is key! Law school applications ask for a resume. My resume prior to then was something they made us do in high school and was no longer professional enough for my needs. I sought help in my undergrad career services office to improve my resume for law school. I highly highly suggest doing this. My resume went from crappy to uber professional in like two short meetings. I finally had a professional resume I could be proud of. You want to be proud of everything you turn into a law school applications and making sure to update your resume with some professional help would be a key part of that. Most law school applications require written references. I used some of my favorite professors from undergrad. It is important to pick a quality reference who knows you well- not just as a name on the class roster who got a decent grade. If you come straight from undergrad, you should likely use some professors or advisors. If you are coming to law school from the workforce, references would likely better serve as your boss or co-workers. The two professors I used I had multiple classes with and I knew very well. I asked them early for a reference so that they had plenty of time to complete it without being rushed and if they got a little slow, it wouldn't push my application back or late. Give yourself and your references plenty of time to make a quality reference that will serve you well. Applying to law school is stupid expensive. It's been a while since I did it but I think that registering for LSAC is like $160, the LSAT is around $150, each application sent is $30 and some schools add an additional fee. It's ridiculous. However, it is a fact of life so have some money saved and put away for these fees so you don't go broke just from applying. Also, don't apply to schools you would truly not attend because it will be a waste of $30. It is important to know where you want to attend law school and to apply to the law schools in that location. I have a friend who applied to the University of Maine, paid the $30 fee and got in but she never had any intentions of going to school that far from home. I personally think that is a waste of $30. I knew I wanted to be in Northwest Ohio so I applied to all schools within 2-3 hours and that was it. 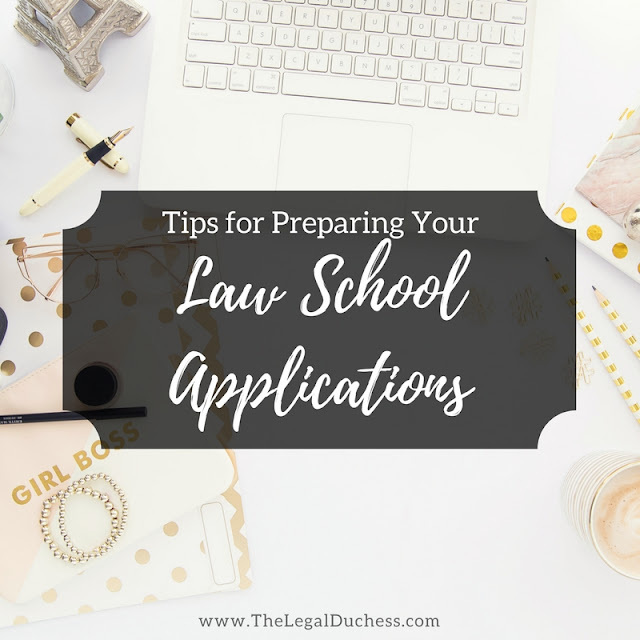 If you don't already know where you want to be, you have more flexibility but it is still best to truly research out a location, what the city is like, living expenses, etc when thinking that may be your choice of where to attend law school. Once you have a location in mind, make a target list of schools to apply to. My advisor told me to pick a few safe schools where I know I would get in, a few contenders where I would likely get in but not a sure thing and at least one or two reach schools where it may be a long shot but you never know if you will get an acceptance letter. I did this and while I was accepted to every school, I chose a middle contender school where I was a strong candidate and they had given me the best scholarship package. The perk of getting everything done early is that you can apply the second applications open! Scholarship money is usually given on a first come first serve basis to qualified law school applicants so the earlier you apply, the more chance of scholarship. Even if you have to wait to take the Fall LSAT (like I did), you can have everything else done and turned in and the moment LSAT scores are released, your application will fully process and be complete. This is definitely an "early bird gets the worm" type of experience so don't procrastinate! Once everything is turned in the worst part begins.... the waiting. Some schools are very timely with responses (I got my first acceptance within 4 days of applying and it was my top choice school/where I ended up attending) and others will take forever (my last response came in May after I had already graduated from college). While the waiting is very stressful, try not to worry too much. You have done the work, did your due diligence and now it is up to the admissions committees. As long as you have done your best work and turned in the most well rounded and quality application you can, you have done well and will likely be accepted somewhere. Best of luck future law students!! Reading this just answered so many questions that I had about the process! I will be starting my applications soon and this was so helpful and motivating! Hi Olivia!! Thank you so much for reading and commenting! I am so glad this was helpful to you :) best of luck on applications!